When people hail the pioneering classics of the RTS genre, they go through a list of usual suspects. Games like Cytron Masters, Dune II, Command & Conquer, Sega’s Herzog Zwei...but there’s one I don’t think ever gets enough due, and that’s Spectrum Holobyte’s Fields of Glory. 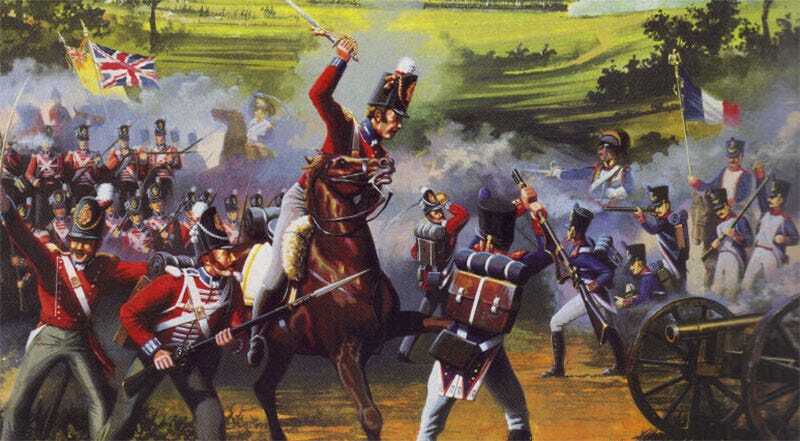 Released on the PC in 1993, and designed by board game legend Jim Bambra (D&D, Warhammer & Star Wars), Fields of Glory was a game set during Napoleon’s last campaign, which centred around his return from exile and the Battle of Waterloo. It looked a little rough, but it did what few games before had managed: to make a genuine attempt to control entire armies in real-time. And by armies I mean armies; not rag-tag collections of tanks and individual soldiers, but representations of historical battles involving tens of thousands of men. There were no resources to harvest or command points to occupy. The goal in FoG’s battles was very straight-forward: to take charge of an entire British, French or Prussian army, from infantry to artillery to cavalry, make the most of each unit type’s strengths and weaknesses then try to run your opponent off the field. The AI wasn’t the greatest challenge, and the UI is a bit slow by modern standards, but it worked. 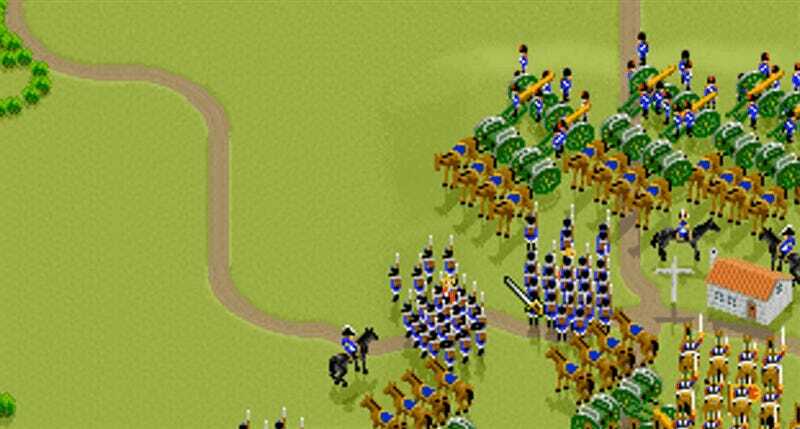 I remember playing this as a teenager and being floored by the way I was given charge of so many units, yet could control them so effortlessly, the game including the ability to pause at any time, issue/queue up orders then resume to see them carried out. Other RTS games at the time (and most since), with their insistence on resources and control points, always felt like I was some kind of militant accountant, or a speed-running farmer with a penchant for occasional acts of vehicular violence. Fields of Glory, on the other hand, made me feel like a General. In a lot of ways, at least tactically, it played like the Total War games would become famous for almost a decade later. No fuss, no fluff, no abstract notions of strategy, just a large army at your disposal and the means to move them around a map, occupy buildings and shoot at your opponent. Pure, 100%, uninterrupted military tactics. For all the good work it did in terms of gameplay, though, bizarrely a lot of people’s fondest memories of the game come not from their time fighting battles, but from reading. See, in addition to the Waterloo campaign (or perhaps because of that campaigns brevity) the game also shipped with an enormous digital encyclopaedia, accessible from FoG’s main menu (below). Within, you could click your way through the entire order of battle for all three armies involved in the campaign. Units would list their battle history, officers had biographies, and many of the campaign’s more notable figures even had their own individual digital portrait. In an age before the internet would have let me Google this stuff on a whim, this was an exhaustive historical resource, one I’ve never seen matched in another video game (or at least one that couldn’t access the internet in-game like Total War can). I sometimes wonder how much work went into it compared to the game itself. 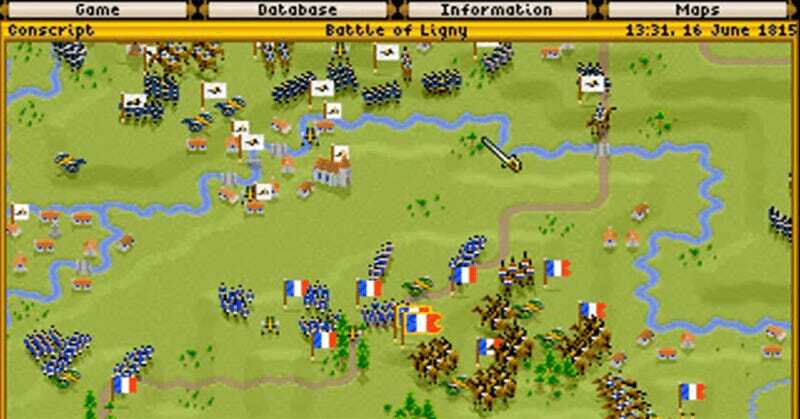 Sadly, despite coming out of one of the biggest PC publishing houses of the 90s, Fields of Glory isn’t available to purchase today, a sad state of affairs for a title that offered so much (and which is still pretty fun today, since its pixel art has aged surprisingly well). If you want to try it out, you’ll have to use your imagination (or make do watching videos like these).